The Medicine Wheel of the Native Americans is symbolic of their spirituality and of the unique, individual ways we go to find our path - a journey of truth, harmony and peace. It is the symbol of the wheel of life, a never ending circle, life without end, forever evolving and bringing new lessons. The Earth walk is built on the understanding that every creature must stand on every spoke of the great wheel of life numerous times to know those truths. and that all directions are to be honored and respected. Until one has walked in others' moccasins, or stood on their spokes of the wheel, they will never truly know their hearts. The medicine wheel helps us with our ‘vision’, to see where exactly we are and in which areas we need to develop in order to realize and become our potentials. It shows us that we are ALL connected and shows us the intricacies of the interwoven threads of life and what our part in it all is. It aids us understanding that without our place in the tapestry the bigger picture would not be as it should be. We ALL bring color, dimension and life to each other, to all of life. It does not matter what color, race or creed we are, we ALL need to create a beautiful existence and expression of the Whole. The medicine wheel is a tool to be used to uplift and better mankind, to heal and re-connect with the infinite. Every-one is a realization of ‘God’ trying to realize self...so find out what part you yourself are. 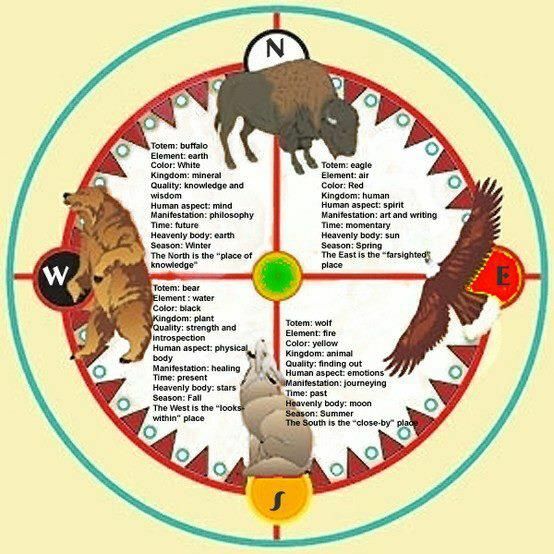 The Medicine Wheel contains the 4 sacred colors and 4 cardinal directions. Also represented by the circle is the ‘circle of life’, with the center of the circle representing the ‘eternal fire’. flying toward the east is the eagle symbolizing vision, endurance and stamina and also the renewal of life and rebirth of the Cherokee Unity. 1. East is red - this color/direction represents spring and stands for victory, success and power. Spring is the re-awakening after an extended sleep - the victory over winter and the power of renewed life. RED was the color of the Native Americans war club which was used to against enemies, and also the one for protection. Red beads were used to call upon the red spirit to guarantee a long life, to get better from illness, for good luck in love, for ball play as well as other undertakings where the benefit of the magic spell was required. 2. North is blue - this color represents the winter and also defeat, failure, trouble, disappointment, unsatisfied desire and sadness. This is a season of waiting and surviving. The Cherokee word for North literally means cold. 3. West is black - this color/direction represents the autumn and stands for death. Autumn brings with it the final harvest and is the end of life’s cycle. 4. South is white - this direction/color represents the summer and stands for serenity, growth, fire, passion, fertility, happiness and peace. Summer is also the time of abundance. 3. The Center is green - the place of the sacred fire, which lies in the center of their paths. In experiencing the Good Red Road that goes form South to North in the medicine wheel, one learns the lessons of physical life. After leaving the physical plain and experiencing death, one goes on to the Blue or Black Road, the world of the grandfathers and grandmothers. Here, in spirit, one continues to learn by counselling those left on the Good Red Road. The Blue Road goes from East to West. The medicine wheel is life, afterlife, rebirth and the honoring of every step along the way.